StogieGuys.com will be taking tomorrow and Friday off to enjoy that most American of holidays: Thanksgiving. (We’ll return Saturday with your regularly scheduled Quick Smoke.) Known for food, family, friends, and football, Thanksgiving is a perfect time to enjoy a fine smoke. So as we did the previous three years, today we’re listing the one cigar we’ll each fire up after the big meal. Patrick A: This year I’m picking the J. Fuego 777 Corojo Robusto, a Brazilian-wrapped smoke with a Nicaraguan binder and Nicaraguan filler tobaccos. I’m betting its balanced notes of dry wood, pepper, citrus, and cream will pair well with a post-meal cup of coffee and a slice of pumpkin pie. Consistently well-constructed, this cigar won’t let me down on my favorite holiday. Patrick S: I’ll be visiting family, which means I plan on lighting up a smaller cigar since I’ll be outside in the chilly northeast air. The small Padrón Serie 1926 No. 35 Maduro fits that bill perfectly. Its decadent and rich coffee, earth, and chocolate notes will go perfectly with a cup of coffee, before I head back inside to watch some football and relax. George E: This year, I’m going to break with tradition and smoke a Cuban, which I’ve had in the humidor for a few months: a Romeo y Julieta Churchill Tubo. It was a gift from a friend who picked it up on a European trip and I’ve been saving it for a special occasion. I think the strength should work well after a big meal, and the size will give me plenty of time to enjoy it on what the weather forecast predicts will be a beautiful day. And, as always, I’ll be thankful for great cigars. 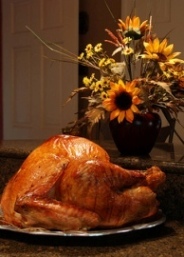 Patrick M: Thanksgiving brings to mind all sorts of comforting thoughts. Time with family, good food, football, and a break from the day-to-day grind. When I think of comfort as it relates to cigars I think of Padrón Anniversary. I never have any construction issues and the balance and complexity are superb. This Thanksgiving after the meal and most of the family has left I plan to sit down and enjoy a Padrón Family Reserve No. 45 Maduro. I think it will be the perfect combination of power to cut through the food, and comfort, to end the day. Have a great Thanksgiving, gentlemen, and thank you for the hard work you all do. If all goes well, I'll be finishing off my Thanksgiving with a Fuente Anejo Shark. @Patrick M: Uncanny! I bought two Padron No 45's back in September for the express purpose of smoking them over the Thanksgiving holiday, one after dinner and the other on Friday. I hope this cigar pairs well with Scotch, which I am intending to enjoy along with the cigar after the last football game that night. Thanks for all the hard work gentlemen. All those sound like fine smokes. For me it'll be an Oliva V Churchill or a Tatuaje Cojonu 2006. I plan on enjoying a Tatuaje The Face on Thanksgiving! J. Fuego's Origen Originals. Vising the family and it's hard to carve out even 45 minutes, so these fit the bill. I myself will enjoy a Cuban Bolivar Royal Corona after the big meal. Happy Thanksgiving to all!